This page may help you to reach any destination. You may find the information about urban transport and how to get to a town or a village on their pages. In these sections you can also find some information about distances between towns, contacts of private carriers and taxis, fares for public transport etc. Services for drivers, like car service stations, you can find in the For drivers section or on the same page of the town or the village. Portal avtostop.in.ua assists passengers in finding drivers, as well as helps drivers in finding fellow-passengers. With the help of region list you can choose the town/village that you are interested in, also you can see the page with information about the transport (menu on the right side, see the model on the screenshot above). We are filling in and adding information to the sections all the time, but we kindly ask you to take into consideration frequent changes in timetables and routes. 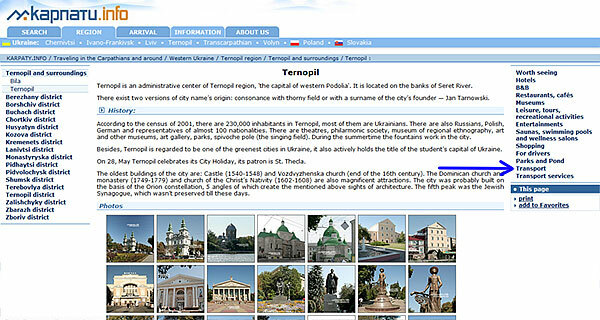 In any case, it is recommended to specify the information at the stations, phone numbers are provided on the same pages. Fixed route taxi (marshrutka) is the most common mode of transport, as elsewhere in Ukraine, which runs within the cities or between the nearest regional and district centres. Recently, this mode of transport has been substituted by buses (the most popular routes). Suburban trains (often "diesels" or "elektrichkas", in the Carpathian area, mainly in Ivano-Frankivsk there is famous "Chervona Ruta") are considered to be the most popular among the locals. Because of the outdated equipment and worn-out tracks, very often these trains are too slow, turning the trip into a real attraction, special impressions can be added by sheep or piglets, which are taken by their owners from or to the market. The main advantage of the rail transport is that it operates according to the schedule. Tickets for trains or motor transport should be better bought at the stations. Public transport may also have regional peculiarities. Large cities have a good transport communication, which is not true for distant towns. It is not worth relying on timetables, especially printed, as far as they may become out-of-date in a week after being published. Buses and fixed route taxis may not go on the schedule, as they may carry tourist groups, also due to religious holidays, bad weather etc. Fixed route transport is often designed for the needs of local residents, so it runs till a fixed time in the evening, sometimes till seven or eight, so take care of your return and find out the time of the last run, but the previous one will be even better. Hitchhiking is another alternative mode of transport, popular among locals, here it is considered to be normal to stop the car on the road and ask the driver to give you a lift. It is a paid service, but usually the pay doesn't differ from the bus fare. In small towns taxi prices are usually low, but mind to ask the price before you go. Most of the mansions and hotels offer their own transportation services. Transfer from the station to the mansion or hotel is often included in the price.